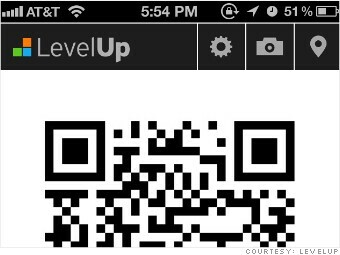 LevelUp is a free app for iPhone and Android phones that's easy to set up. First, you enter your card info. When you're ready to make a payment at a participating merchant, the app displays a code merchants can scan. LevelUp targets small businesses, and has 3,800 participating retailers in the U.S. I hit one set-up glitch. A feature allowing you to scan your debit or credit card with your phone's camera flat-out didn't work. I resorted to manually typing in my American Express (AXP) digits. I used LevelUp to buy coffee at West Village snack shop Victory Garden. It worked seamlessly: I held my phone up against the device LevelUp gives retailers, which scanned and charged my phone within seconds. The transaction was by far the smoothest one I had during my day of wallet-free shopping. LevelUp's hook for consumers is its built-in discounts and loyalty program. Retailers usually offer breaks. When I bought my coffee, I automatically saved $1. LevelUp says its users typically save $25 per month.